Hip Hop Pendants are new style of jewelry that is taking the the world by storm. With big, bold and courageous designs, Custom Hip Hop Necklaces add a new element to jewelry making. Hip hop jewelry is some of the most difficult to create. It isn’t uncommon for a single piece to utilize all the skills of the most talented jewelers. Because of their big and over the top design, hip hop jewelry was limited to a select few. Namely the rich and famous, for many years. However, due to ever increasing prices in gold, platinum and diamonds, jewelers were forced to develop innovative means of creating affordable jewelry. Thanks to many breakthroughs in the industry, hip hop jewelry is now available to the masses. This is probably the favorite of our Custom Hip Hop Necklaces so far. It was HUGE and over 500 diamonds in it. We can create pendants like this to your specs and usually for less than many custom jewelry makers. Custom Hip Hop Necklaces – WHat is it? Hip hop jewelry comes in many forms and is more of an idea than a concrete thing. If you’ve got an exposed body part, there is hip hop jewelry you can purchase to wear on it. Hip hop jewelry styles are available in the such forms as Custom Hip Hop Necklaces, chains, watches, rings, earrings, belt buckles, jean chains, teeth grillz, shoe grillz, and more. This TRX Pendant was created for a British Hop Hop group of the same name. They wanted something that would bling while on stage and so we accommodated their wishes. It was only an 1.5 inches wide, but still had almost 2 carats of diamond in it. Custom hip hop necklaces don’t have to be paveed with stones either. Here, we just created a channel running the length of the piece and filled it with one row of stones. Hip hop jewelry is ultra hot and is here to stay and at Valeria Fine Jewelry, we are always among the trend setters, no matter the type of jewelry. Custom jewelry is as pervasive as ever in today’s modern-day hip-hop culture. The most influential rap stars of the day all wear jewelry. In fact, some jewelers are almost as famous as their superstar clients, with social media follower counts numbering in the hundreds of thousands in some cases, just due to the coolness of their creations. This custom pendant was made for the owner of a record label. We don’t always have to use stones for color. In this one, we used enamel for the name. The Black diamonds were flush set, which is a little messy, but we did it for budget reasons. We can take almost any name, nickname, or catch phrase and turn it into a custom pendant. We can use almost any font you can find or we can create something from scratch. Are you a rapper, label executive, or producer looking to become a big fish in the huge ocean of music talent? Nothing gets you noticed and builds brand awareness more than Custom Hip Hop Necklaces that sparkle from across the room. Custom Hip Hop Necklaces with your logo or name are a great way to promote you, your company, or to thank your workers for going above and beyond the call of duty or for extended service. They also just look cool. That is reason enough to wear blingin’ custom Hip Hop Necklaces for every occasion! Although not iced out like most Custom Hip Hop Necklaces, this is the pendant we created for G’ed Up Productions. It was 2.5 inches in diameter and only had diamonds on the G and a few on either side of it. But it was still a stunning piece that was exactly what the customer had in mind. Custom Hip Hop Necklaces – Give us a Shot! If you’re thinking about having a Hip Hop Necklaces created, give Valeria Fine Jewelry a chance to show you what we can do. Owner and artisan jeweler Lucas Horton can transform almost any idea you have into custom Hip Hop Pendants or pin for less than you think it will cost. Custom Hip Hop Necklaces can be made in one piece up to 3 inches wide or tall, and can be cast in brass, bronze, silver, gold, palladium or platinum. Add in some diamonds or gemstones, and you are on your way to blingville. This is not one of your typical Custom Hip Hop Necklaces, but it still falls into the genre. It is big, has lots of diamonds, and is attached to a thick curb chain. 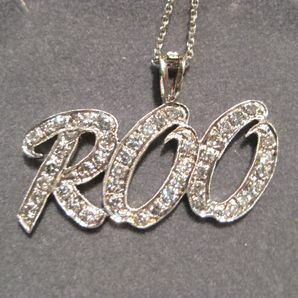 It also calls attention to the wearer in a major way, which is another trait of Custom Hip Hop Necklaces. However, it best serves as another example that we can make almost anything that you can dream up! Lucas is a GIA Graduate Gemologist and creates his Custom Hip Hop Necklaces using a state of the art CAD program in addition to lost wax casting. This type of manufacturing opens up a whole world of possibilities not available from the mall . Additionally, he can take your ideas or sketches and turn them into a stunning work of art. By mixing different colored metals, diamonds or colored gemstones, you can turn your logo or name into Custom Hip Hop Necklaces you can be proud of. With his expertise in gemstones and diamonds, Lucas has compiled a number of reputable dealers from around the globe. So you can expect the highest quality materials at the best prices available. Explore Valeria Fine Jewelry’s portfolio of rings, pendants, bracelets, and earrings and see for yourself the precision, detailed intricacy and artisan craftsmanship that goes into each of Lucas’ designs. If your expectations haven’t been exceeded, then Lucas hasn’t done his job. Google Valeria Fine Jewelry and you will find hundreds of 5 star reviews across multiple marketplaces. Give them a chance for Custom Hip Hop Necklaces and you will become one of the hundreds of happy customers. These are just a few of our favorite Custom Hip Hop Necklaces we have created. Think of them as samples of what we CAN do. We can make anything you have in mind and invite you to share your ideas with us. It will cost less than you think to have your own custom iced out necklace! Click HERE to learn more about custom jewelry or to contact us with your idea. Click HERE to see more of our Custom Hip Hop Necklaces.